Today, we are incredibly excited to announce a new feature for Alexa developers to take advantage of: entity resolution. 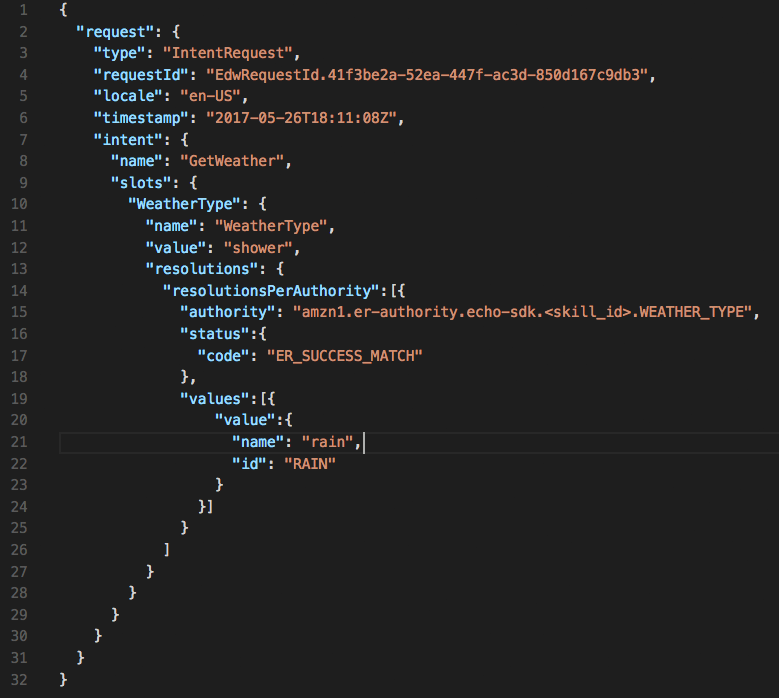 This enables you to define synonyms for the Alexa Service to resolve rather than having to figure this out in your code. For example, in your Alexa skill, rain may be synonymous with, downpour, shower, storm, and rainstorm. When the customer says downpour, the Alexa Service will let you know that they said “downpour” and it will also let you know that it’s a synonym for “rain”. "When is it going to rain?" "When is it going to shower?" "When is it going to rainstorm?" "When is it going to downpour?" "When is it going to storm?" "What is it going to be wet outside?" In the old model, you would have to be able to catch all of those words as slot values, compare them to a group of values in your code, and determine which weather condition to return to the user. Take a look at the code block below. You can see that the slot value "shower" is stored as the value of the slot "WeatherType." Now, with entity resolution, however, you can treat all of those statements equally, and return the word "rain" to your code in each instance. To do this, Alexa now includes a "resolutions" node that contains the additional information we are looking for. 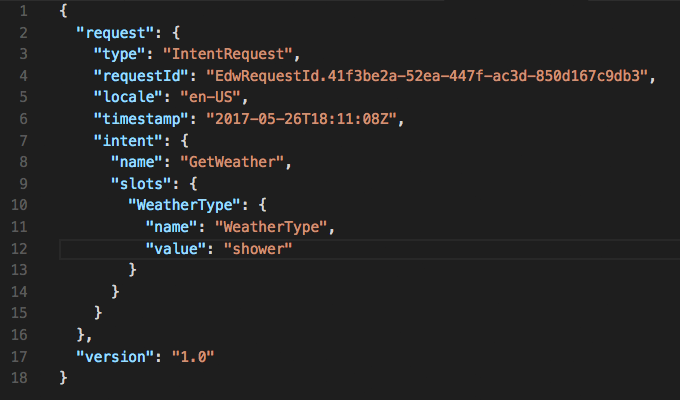 In the next code block, you can see that the IntentRequest still passes "shower" as the value, but the word "rain" appears as our resolution value. Example of a request with entity resolution showing that “shower” is a synonym of “rain”. With this additional information available to you with each slot value, you can make more consistent, reliable decisions for your users. 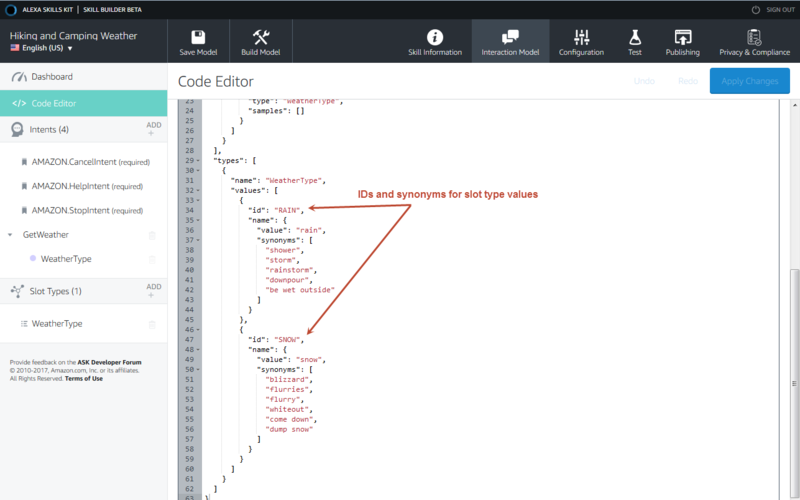 Currently, you must use the Code Editor in the skill builder (beta) to define synonyms and IDs for slot values. You can continue to create slot values using the normal skill builder user interface, then switch into Code Editor to fill synonyms and id properties. For details, see Define Synonyms and IDs for Slot Type Values (Entity Resolution). We are very excited to see how you will use these new additions to the interaction model!